Aci Castello is a small village on the Ionian coast of Sicily and known for its black Norman castle and picturesque square. The views from the castle, built of lava stones from Mount Etna, are spectacular.The castle was founded by the Normans in the second half of the eleventh century and is perched on the top of a volcanic rock. If you keep walking few kilometres north along the rugged coast you will encounter another fishing village. 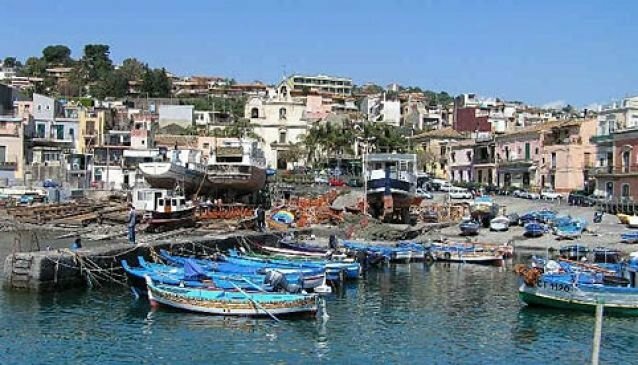 Aci Trezza is mainly known as the scene of the events in Giovanni Verga's famous novel 'Malavoglia'. The Faraglioni or Scogli dei Ciclopi (Rocks of the Cyclops) are, according to legend, huge pieces of lava rocks that the one-eyed giant Cyclops threw at Ulysses.